2941 Mediterranean Street Food review, pics, hours, and menu info. 2941 Mediterranean Street Food is located in Rochester Hills at the southwest corner of Rochester and Auburn roads. It’s named such because 29N/41E are the Longitude and Latitude for the Mediterranean and Mideast. 2941 Mediterranean Street Food is a unique concept as it serves up Mediterranean Food, Fast Food style. I personally have never seen this before, and was quite impressed. 2941 Mediterranean Street Food serves street food from Greece, Turkey, Israel, Egypt, Tunisia, Cyprus, Lebanon and more. 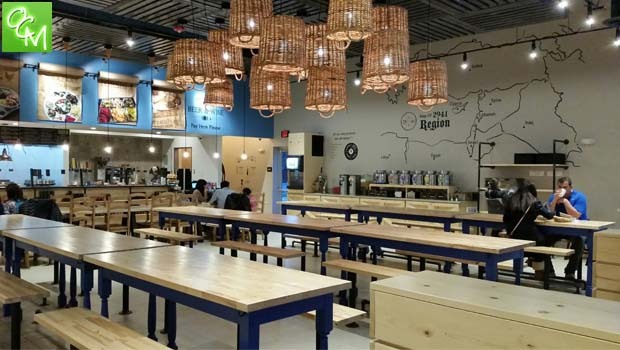 They also feature build your own Bazaar Meal, a variety of street snacks, street platters, Samoon bread baked fresh in front of you, salads, desserts, all natural sodas, juices, and imported and domestic beer and wine. 2941 Mediterranean Street Food serves everything fresh, made daily, in-store. None of their foods have GMO’s, MSG, transfat, etc. It’s never frozen, there are gluten free options, it’s locally sourced, all natural, AND they use organic ingredients whenever possible! I found the food at 2941 Mediterranean Street Food to be slightly different than the Mediterranean food I am used to ordering at the authentic restaurants, but not in a bad way. It just seemed to have it’s own twist on things. It was flavorful, and the staff was incredibly helpful when I was looking for gluten and dairy free options. There are even recipe labels on the glass at each food option so you can read the ingredients. I wanted to try a few different things so I kind of put together an a la carte order of 5 Grain Falafel, vegetarian stuffed grape leaves, and some Baba Ghanouj. It was perfect and I’ll definitely go back. I don’t eat meat, and these were great options for me. 2941 Mediterranean Street Food offers catering services. Online ordering is available as well. See related articles and posts below or our REVIEWS/RESTAURANTS tab for more Oakland County and Metro Detroit MI restaurant reviews, pics and more. For more info on 2491 Mediterranean Street Food, visit 2941streetfood.com.